24Shells Inc. servers are housed in one of the largest most sophisticated data centres in the greater New York Metro area. Our infrastructure has been designed for speed and availability without compromise on cost. We operate a secure environment that is staffed 24/7/365 to ensure a rapid response capability for any event. 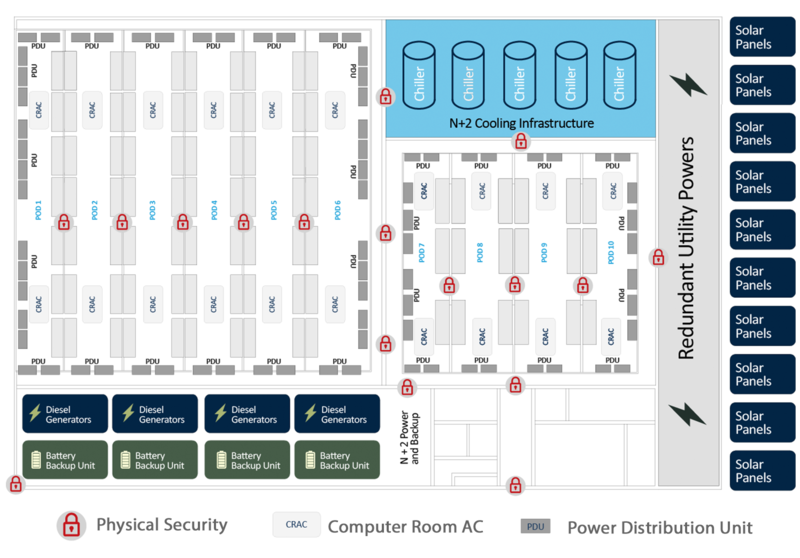 24Shells Inc. data centre has been equipped with n+2 power redundancy, n+2 diesel-powered emergency generators and an n+2 cooling infrastructure. We provide cross-connect capabilities for the meet-me-room which contains links to diverse carriers on premises as well as local access to Internet Exchanges in NY/NJ Metro area. 24Shells Inc. data centre features ballistic glass enclosed secure front window areas and access loading dock. Access to the facility is protected by a quad-authentication platform comprising of key card, biometric, video surveillance and human security guard access control. A security fence surrounds entire land area/building with a permanently staffed perimeter guard house. Every cabinet is contains network and power redundancy to the tune of 20Gbps and 22kW amps respectively to ensure a 100% SLA guarantee. Our energy efficient LEED certified data centre also utilizes its efficiency from giant solar power generators. There are more than 6,000 solar panels that can generate 2.167 MW at peak power. One key attribute of the environmental design is the harvesting of rainwater and the reutilization of cooling tower blow down water for site irrigation. No other data centre facility in the region does this.